So many good things this week! To start the week, we tried a new restaurant in Redmond that had delicious cocktails and a burger with a slab of pork belly on top (!!!) that was absolutely fabulous. On Wednesday afternoon, we headed to the Olympic Peninsula for a long weekend of hiking with Andy's family. We made it to the coast just in time for dinner and one of several spectacular sunsets. 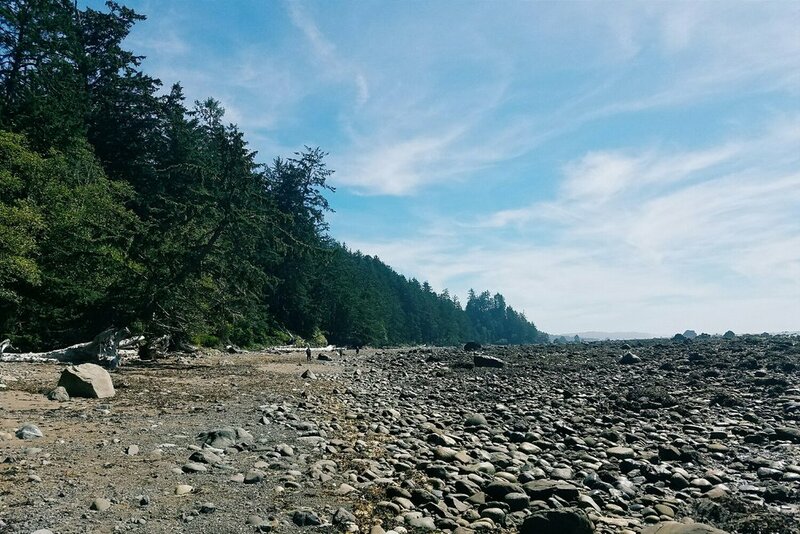 We spent our days hiking as much of the remote Olympic coastline as we could. Along the trails, we gorged ourselves on wild huckleberries and wild blueberries. The tides were never particularly low, but we did manage to find some small tide pools on Rialto Beach, along with lots of interesting metal debris we eventually decided came from an ancient shipwreck. For the most part, the weather was hot a sunny, which seemed completely out of character for the coast. During our long days hiking on the beach, the foot pain I've been noticing on many of the longer hikes I've done this summer became much worse, which was frustrating although it did lead to many huckleberry breaks while I sat for a while to give my feet a break! I'll definitely want to get that figured out before it becomes a serious issue that prevents me from hiking entire! Even with those issues, the whole weekend was one of the best vacations we've had in a while! For years, all my favorite trails led to lakes. On day hikes in particular, I'd bring a lunch and a book, and once I reached the lake, I'd find a (hopefully!) quiet spot to sit and munch and read for at least an hour. I didn't understand the point of trails to ridges and basins. If there was no specific destination, how did you know when to stop hiking? When did you get to sit and read? Over the past year though, I've started to appreciate ridges and passes more. Sure, the stopping point is often less obvious, but that means there's room to wander and explore. And it's hard to beat the views you get from a pass or a summit. Until recently, I never would have considered hiking somewhere like Marmot Pass, but I'm so glad that's changed!